A fifth generation family business, Hypnos has been practicing and perfecting the art of making luxury pocket spring beds by hand since Edwardian days. Using traditional, time-honoured skills that have been passed down from generation to generation, the company has over 100 years bed making experience. Internationally renowned as the expert in making handcrafted deep pocket spring beds, Hypnos combines traditional skills with constant innovation, using only the finest natural materials. 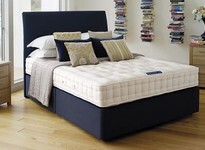 With a reputation for making the most comfortable beds in the world, Hypnos make beds that incorporate pressure-relieving pocket springs with built-in ‘memory’ and ‘active turns’. 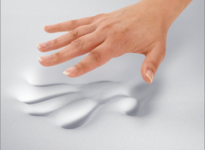 The pocket springs found in a Hypnos mattress have been uniquely designed to immediately recognise your body’s unique imprint, sensing your shape and weight distribution, providing comfort and support exactly where you need it, and seamlessly adjusting to you and your partner’s every move. Hypnos pocket springs come in a choice of UltraSensor or ReActive pocket springs. ReActive™ pocket springs have up to 10 active turns, whilst the new patented UltraSens™ pocket springs have up to 17 active turns. 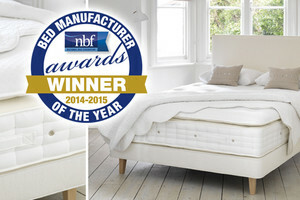 The only company to have won the National Bed Federation's (NBF) "Bed Manufacturer of the Year Award" TWICE, in 2014/15 and 2011/12, Hypnos is also the only bed manufacturer to actively supply the British Royal Family. The Hypnos Collection of beds and mattresses includes the Royal Comfort Collection, Regency Collection, Heritage and Orthos Support Collections. 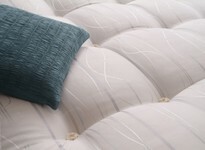 The range also includes its No Turn hand crafted Pillow Top Collection, and the Pillow Turn and Pocket Latex Collections. Part of the Hypnos Royal Comfort Collection of Beds, the Hypnos Eminence 4' 6" Divan Bed features latex, lambswool and hand teased wool wrapped around a unique hourglass shaped pocket spring system for superior ‘tiered’ comfort. The mattress topper on this bed also features soft and breathable latex and lambswool to help regulate body temperature, and is covered with a wool-infused Belgian Damask. The deep divan features a glued and screwed solid timber frame with individual fixed cone springs, hand lashed together with jute webbing, below a horse hair and wool comfort layer. The Hypnos Orthos Cashmere 5' Divan Bed offers head-to-toe zonal support from its three zoned ReActive™ 10 pocket spring system and is upholstered with naturally soft and breathable layers of Cashmere, Wool and eOlus™ sustainable fibre. 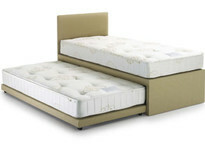 This orthopaedic bed is hand tufted and matched with a deep padded, non-sprung divan, the Hypnos Orthos Cashmere King Size Bed comes with either a shallow base or a traditional deep divan base and benefits from hidden storage drawers, a super-storage ottoman base or a hideaway divan for maximum storage. 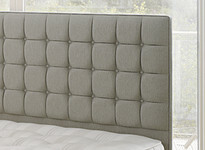 The Hypnos Luxury Turn 6' Mattress is a two-part sleeping system available in a medium or softer comfort level. The core mattress features a ReActive™ 8 pocket spring system, which is tailored with 3 rows of genuine hand side-stitching and hand tufted. Whereas the removable zipped topper features soft and breathable British wool and luxurious white hair and is covered with a silver-infused, 100% cotton, stretch knit fabric. At Dalzell's of Markethill all our beds & mattresses adhere to the stringent standards of the National Bed Federation, with the Hypnos Collection no exception. Not only is Hypnos the NBF 'Bed Manufacturer of the Year Award', but their beds also come with a Royal warrant for extra prestige. Dalzell's are delighted to add Hypnos to our product portfolio. So when you buy a new bed from us you'll not only be getting a brand you can trust but we'll also Deliver your Bed for Free and Recycle your old divan bed throughout Northern Ireland and Counties Dublin, Louth & Monaghan. We’ll even remove & Dispose of Packaging and assemble your new divan bed and mattress in a room of your choice and provide you with Free Pillows. Delivery is also available at competitive rates throughout the rest of Ireland. With additional discounts for Multibuy, and our Price Promise, you can be sure you're getting a great deal because we appreciate your business! Call, Email or Visit Us In-store.